Beef achar is a tasty pickle item prepared in Kerala.It had always been by companion during my hostel life. 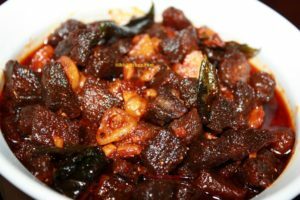 For all those meat lovers who wishes to have meat for their meal time,prepare a pure vegetarian meal and give 2 teaspoons of this pickle on the side..they will happy and content. 1) Wash thoroughly and marinate small pieces of beef in turmeric and salt. Steam for about 10 minutes in pressure cooker.Shallow fry the beef pieces and keep it aside. 2) Heat Oil and fry chopped garlic,ginger,curry leaves and green chillies well. 3) Add the chilly powder,black pepper powder and garam masala powder and saute until raw smell is gone. 4) Add salt and vinegar and bring to a simmer. 5) Now,add the fried meat pieces into the gravy and simmer for a minute. 6) Allow the pickle to cool and then store in air tight sterilised glass containers. Shelf life is more when you increase the amount of oil and vinegar.